I am sure you remember the lead up to Q1 2016. The US economy and stock market were transitioning from a Goldilocks environment and narrowly avoiding a bear market while the rest of the world was still battling deflation. Precious metals and commodities were in the dumper and try though US and global central banks might, they seemed to fail to woo the inflation genie out of its bottle at every turn. 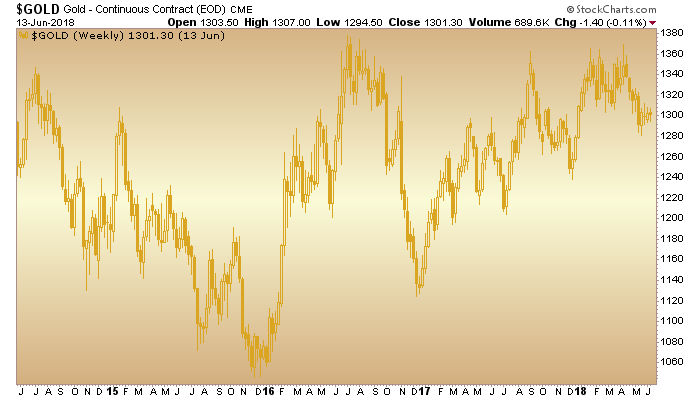 Then came December of 2015 when gold and silver made bottoms followed by the gold miners in January of 2016. Then by the time February had come and gone the whole raft of other inflatables (commodities and stocks) had bottomed and begun to set sail. As I listened to Mr. Powell speak about inflation yesterday my mind wandered back to Q1 2016 as I thought about the Fed trying to manage inflation at or around 2%. I also thought about how inflation tends to lift boats, not sink them. At least that is what it does in its earlier stages, in its manageable stages. The balls out post-crisis inflation begun by Ben Bernanke was a massive market input and I suspect we have not yet seen its full effects – other than in US stock prices thus far. So dialing back to Q1 2016 let’s look at a few pictures, beginning with the Fed’s 10 year breakeven inflation rate, which bottomed… you guessed it, in Q1 2016. That means that ‘deflation expectations’ topped at that time. A month or so earlier gold had made its low, amid deflation’s last gasp. I often talk about how gold is not about inflation and that deserves a qualification. Gold is not only or even primarily about inflation, especially when the economy is doing well against an inflationary backdrop and interest rate dynamics are not favorable. That is the case today, but gold led the whole show and it is marking time now (in its laborious post-2016 uptrend) perhaps for when the inflation starts to cut into the economy’s bones. 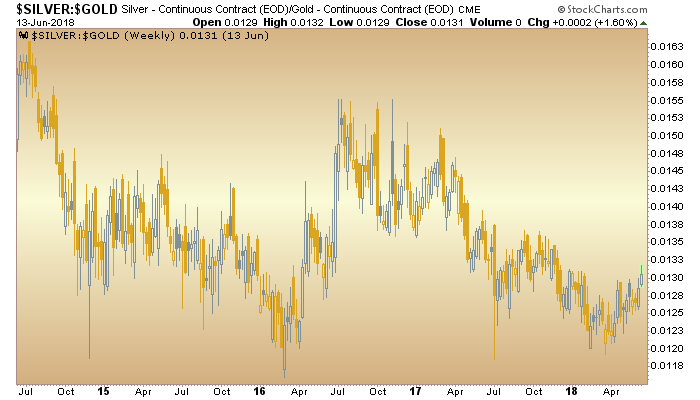 Silver on the other hand has more pro-cyclical utility and though it appears strange for silver to have been lagging gold during an inflationary economic expansion, the hysterics of the 2016 spike have needed to be worked off; and worked off they have been… for going on 2 years now. We can clearly see that silver got ahead of itself in 2016 as the inflation this ratio had sniffed out has proven very slow in manifesting. But manifest it will if the signals across various indicators (flattening yield curve notably excepted) continue on their current course. 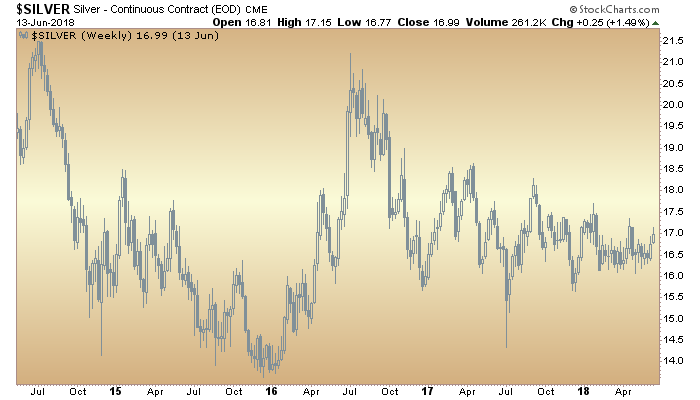 You might be able to imagine a trend line being broken on this weekly chart of the Silver/Gold ratio. So the yield curve continues to flatten but nominal interest rates continue to rise, which is consistent with building inflationary pressures. The 10 year yield bottomed in mid-2016 and has recently hit and exceed our target of 2.9%.